I had another opportunity to play KoW recently. My good friend, Darth Sabre, was interested in giving it a go and chose Basileans, one of the main factions in Mantica, that is unique to this world. I was glad to face them as it is always good to learn more about my own force when fighting against variety of opponents. Basilileans army has that feel of pious and angelic warriors in shiny armor about them and I think Darth's army captured it nicely. The mounted and foot Paladins rode to war inspired by a Priest and High Paladin and were accompanied by Elohi and Ur-Elohi Angles as well as some regular troops formed in two hordes. The army wide rule (I must say I really like that each list has one) is called Blessed Be The Pious and means that the units have Iron Resolve special rule, i.e. if the unit is Steady as a result of nerve test it regains one point of damage previously suffered. I like the fact that although the army wide rule has some characteristic name it really is one of the special rules from the core rules. In the case of Basileans it simply means they can heal themselves a little bit. Since each of the character also has Heal(3) ability it means these guys can take some damage and keep fighting. 40 Men-at-Arms - one of the main battle line units, these men-at-arms form proper phalanx with their shields and spears and that is not good news for my cavalry at all. With very good nerve they can take some damage before they are even remotely worried and with 30 attacks even the best armored units on my side might be in danger. 5 Paladin Knights - Darth got two of these and it was interesting to compare them against my own Stormwind cavalry. Elves are faster and hit a little bit more often due to Elite rule. Paladin Knights seem to have better nerve though and are also Headstrong which means they have a chance to ignore waver effect. I was curious to see how both armies will use their respective knights. 5 Sisterhood Panter Lancers - it is Basilean's version of light cavalry, very fast and nimble but unlike Silverbreez they are combat orientated. They have Thunderous Charge (1) and Vicious that helps to go through with their attacks. However, they are also very lightly armored and may be vulnerable to enemy fire. Priest - mounted priest was there to support with his heal or bane chant but also to inspire. 40 Crossbowmen - another horde but this time of shooters. 20 attacks is something to be concerned with but I was glad to notice they are also re-load and Range 5+ so that their effectiveness can be limited. No wonder Darth gave them extra range so that he does not have to move them much and have enemies in range. With crushing strength these shooters will do damage for sure so I had to be careful and don't give them many juicy targets. 6 Elohi - the best unit of the army, these angelic warriors are the most dangerous opponent. They don't waver and hit very hard. They are also Inspiring which is amazing on its own as it is already relatively hard to rout them with Defense 5+ and nerve -/17. As they fly I will need to be careful about places they can land. I also presumed they could be used as a counter to my drakons too as in general, my fliers are not as tough and hard hitting. Ur-Elohi - the toughest model in the army, can easily take on my troops on its own. But serves a lot of secondary purposes too since it inspires and heals. As flying large infantry it is extremely fast but easier to hide and could be used for individual missions such as war machine hunting. At the same time it can help wherever it is needed the most. I absolutely love such flexible and versatile characters. 20 Paladin Foot Guard - another regiment that can be directly compared to one of my own - Palace Guard. In this case it is even more interesting than between heavy cavalry. Paladins are slower but better armored. Guard is faster, hits more often and has Crushing Strength. Then, Paladins are Headstrong which means they are more likely to keep fighting. Again, I was really curious to see how respective units are going to perform and what roles will they be assigned. High Paladin on Griffin - last but not least, there is another of super fast but flexible characters in Basilean army. It has one more attack than Ur-Elohi and better nerve but defense 5+. They look very similar so I wonder how would they be utilized in the game. Here is my own army list for comparison although I haven't changed it since the last game against Orcs. In general, I have a slight advantage in speed over Basileans if you compare units of the same type. I also have 15 elements against 11 of the enemy but I have a feeling they have better staying power with more units that have Defense 5+ and I have none of 6+ as well as hordes that can soak up some damage. I have more and dispersed shooting which I like because that would allow me to use it against many targets at the same time. Basileans have more and harder fliers though so I think they can really balance out my speed and numbers advantage. My aim was, before I took terrain into account, to use my shooting to start taking away troops and hopefully create some holes in the battle line which I could then exploit. 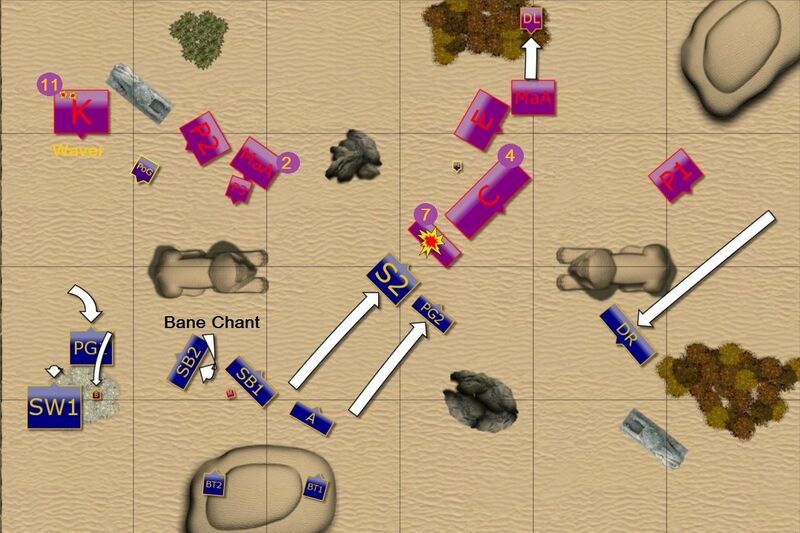 Even if these troops were not routed I would have better chance to do so in melee. I was prepared to lose some of my own troops, even one per turn due to crossbows and their superior range. We agreed to have level 2 hills, obstacles level 1 and forests level 4. 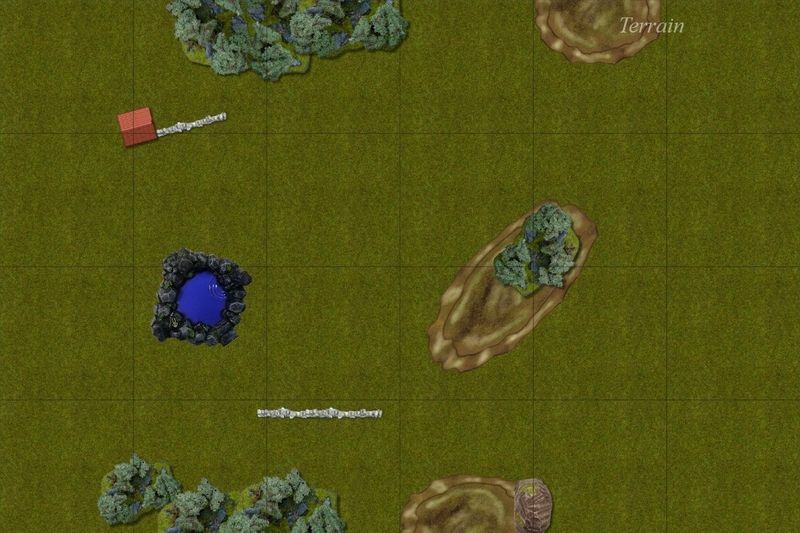 The lake was a blocking terrain for the purpose of movement but didn't affect line of sight at all. We rolled off for sides, I won and picked South. It was then my turn to deploy the first unit. 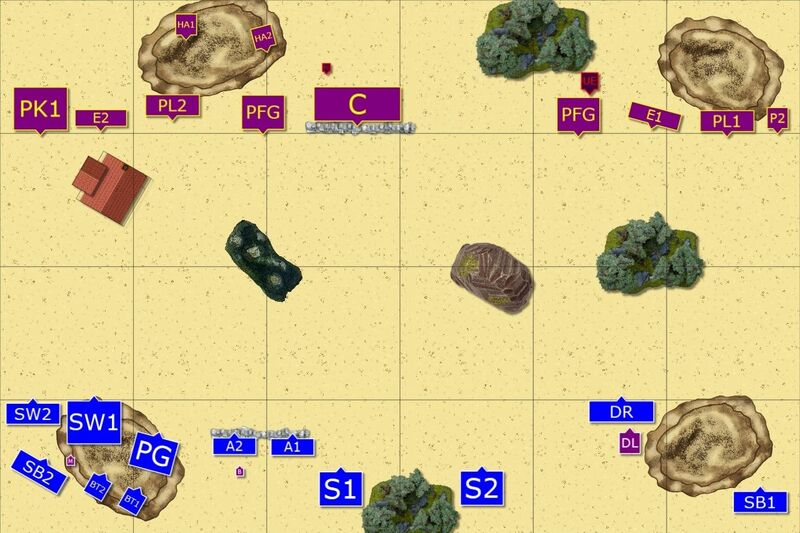 I chose South because it looked better for me in terms of initial defensive position and ability to advance on the right flank with the hill/forest blocking line of sight. During the deployment the most important for me was to learn where Crossbows are going to be. As Darth put them in the center but at the deployment line it meant I could have safe passage on the right and could avoid it on the left. 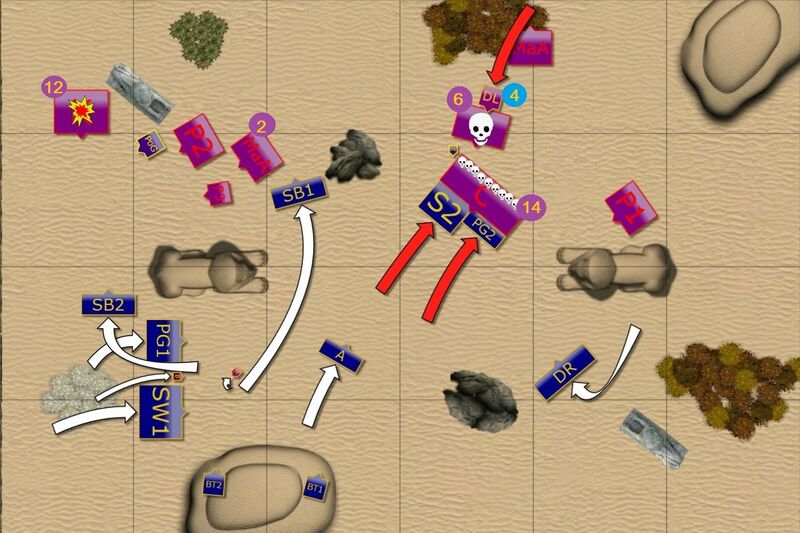 However, he kept Crossbows until the last possible moment (even with characters after and the gap left in the middle) so I had to deploy my units well until that moment. I decided to use the obstacle for extra protection for my own shooters and use them in the middle so they had the best choice of targets. I also positioned my infantry in the center where they enjoyed some protection of the hill but were able to go towards any direction. Finally, I left my faster troops to be deployed on the flanks but I also waited with them till the last to decide how I want to group them. 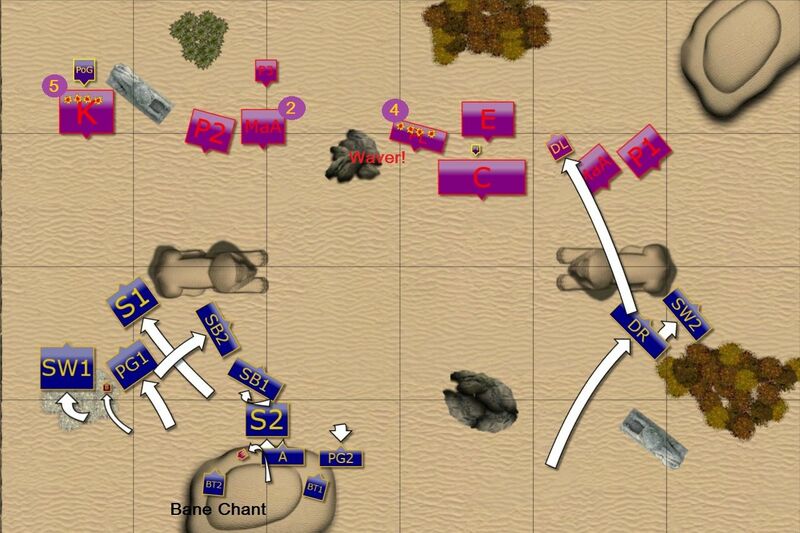 In the end I decided to go with cavalry on the left flank as I could avoid Elohi for a while. Initially, I thought I could use the hill and the fact I have Pathfinder on Stormwind regiment to approach the enemy in relative safety. However, I changed my mind because it was too crowded on the right flank and Elohi, Ur-Elohi and Spearmen phalanx were all problematic for my cavalry there. I wanted to win the left flank and be able to approach from two directions. 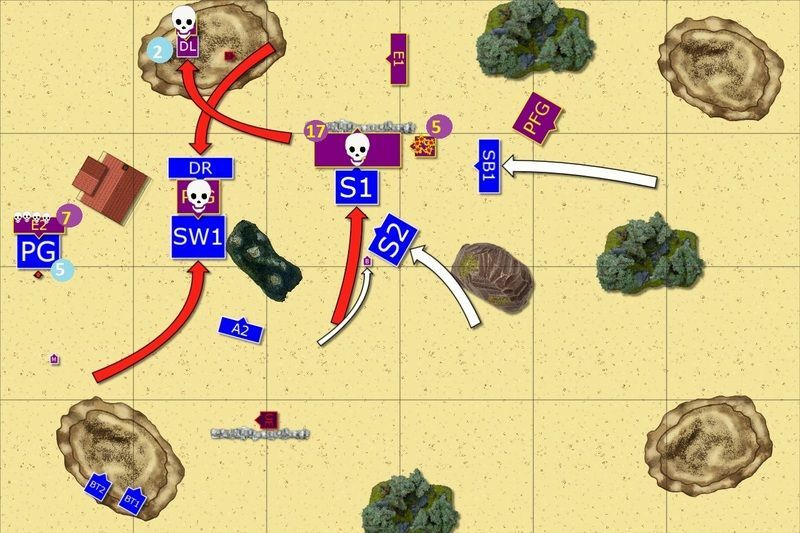 The fast cavalry and drakon riders on the right flank were to get rid of the panthers and possibly annoy the horde to slow it down and avoid situation where it engages into combat at all. Drakons would also avoid being shot at but had the chance to jump over enemy troops as they approach my lines and try to harass them from there. 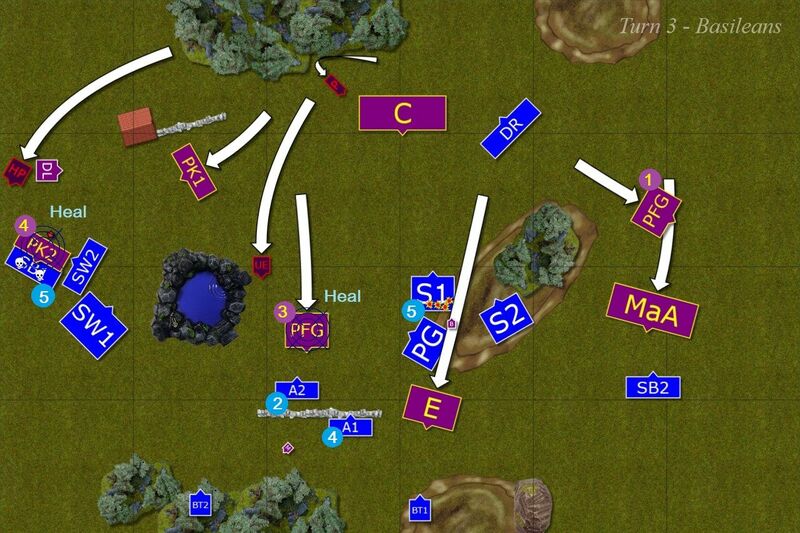 Elves moved forward but only in order to get into range. The shooters all focused on enemy cavalry, inflicting some damage and even shaking Paladin Knights in the middle! No target was routed yet. Basileans were not that eager to get into a fight. 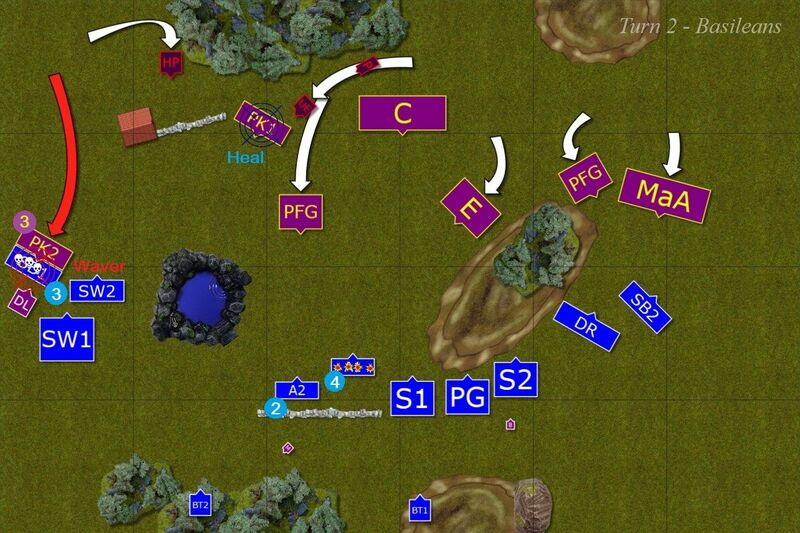 The forces on the left flank even pulled back to avoid charges. Crossbowmen tried to return the favor but surprisingly their shooting was not as efficient as they hoped for. Fortunately, healing went according to the plan and the Knights looked unscathed again. 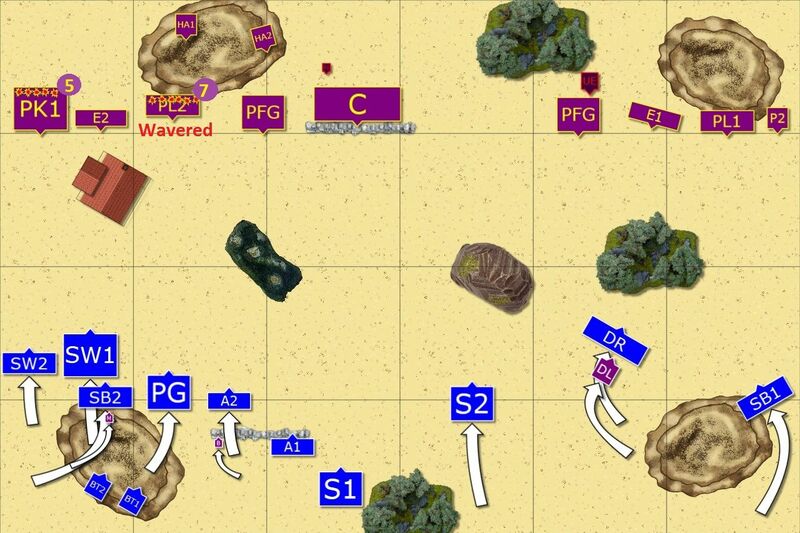 Outcasts continued their advance on the flanks and softening the enemy with shooting. It resulted in routing Panther Lancers and doing some damage to the Knights again but they remained unimpressed. The squadron of Knights decided it is time to charge elven fast cavalry but didn't inflict substantial damage and didn't route their enemies (although got them wavered). Their companions got healed again and foot Paladins sprinted alone towards Elven Archers. Crossbowmen improved their accuracy but the Archers held their ground. 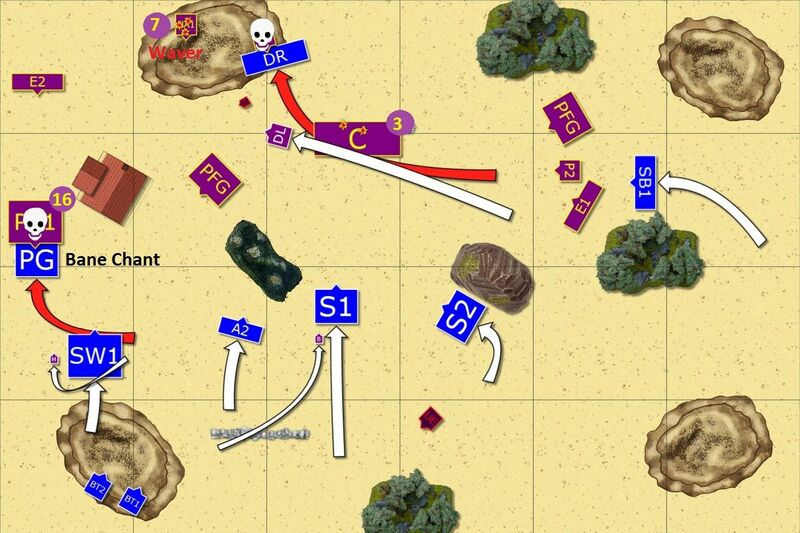 Storm Wind cavalry charged the exposed flank of the Knights but surprisingly, didn't route their enemy either! The shooters focused on Paladin Foot Guard this time as they looked like more direct threat. 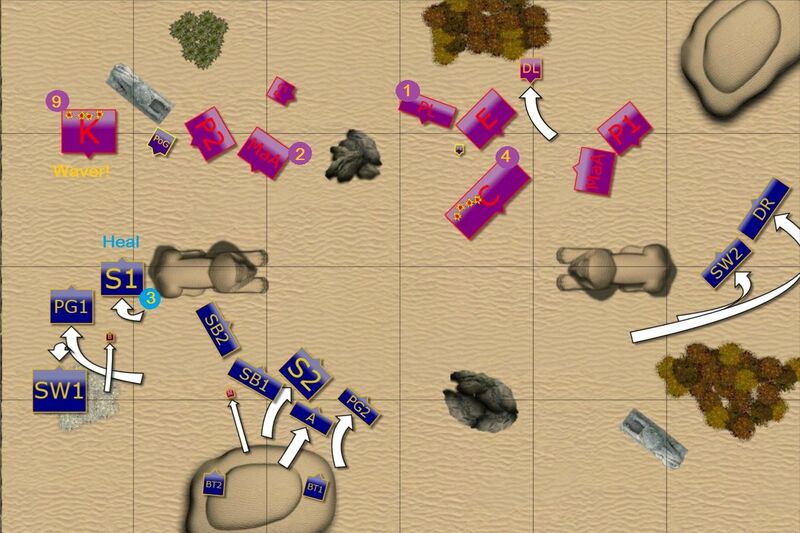 In the middle, Elven infantry maneuvered so that Palace Guard could intercept Paladins while Spearelves formed defensive formations against possible attack by Elohi. Last but not least Drakes used the opportunity and landed in the safe spot behind the enemy lines. Basileans move forward. The Knights on the left flank got healed a little and tried to rout Elven fast cavalry but they lost their impetus charge bonus and could not do enough damage to succeed. Their companions decided to move in but their help might be coming a little too late. Paladins and Elohi moved full speed through the center as it seems Basileans had enough of Elven war machines. Finally, Crossbows chose to unleash another volley and inflicted some damage upon Spearelves but Elven phalanx didn't shake easily. Drakon Riders also had a nice flank attack to execute and shut down Basileans shooters easily while Elven Archers, Bolt Throwers and Silver Breeze cavalry focused their fire on Ur-Elohi and inflicted quite a significant damage! Ur-Elohi flew heavily toward the archers and it barely managed to inflict some damage but somehow it was enough to rout already wounded troops. Elohi had absolutely no problem in shredding the Bolt Thrower to pieces and reformed to look for new targets. Finally, crossbowmen tried to break through but they are not as good in close combat as their spear armed companions and Elven Spears held. Surrounded and wounded crossbows stood no chance against the co-ordinated attacks of Spears and Drakons, especially that one of the Spears regiments attacked and routed nearby Priest so that he could not inspire his units anymore. The rest of the army re-arranged the formations and the shooters once again tried to hunt down Ur-Elohi but once again it was not to be. Elohi destroyed another troops of Archers while wounded Ur-Elohi flew back to safety. High Paladin tried to get rid of the bolt thrower too but the war machine miraculously survived! 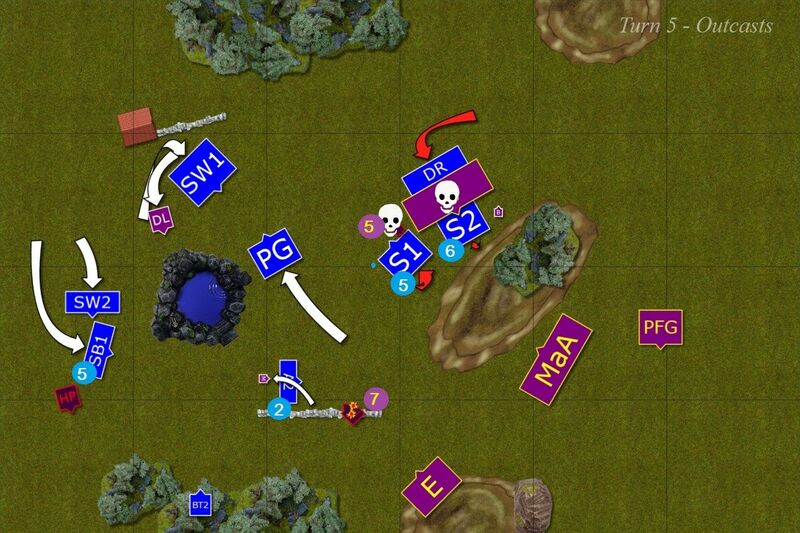 The armies had to disengage at this stage and it looked like this time Elves were a little bit more successful. Due to time constraints we had to finish our game after 5 turns (we beginners are still slow, in particular online) so we just checked if there would be turn 7 and it turned out the game would have lasted only 6. We did try quickly some things to see what could happen though. For example, my heavy cavalry could charge High Paladin but only wavered him. Shooters could not force another force check on Ur-Elohi and then there were no targets to attack save Bolt Thrower for Basileans. First of all, I would like to thank my friend Darth for great game! It was fantastic to play again after few months since our last battle and I hope it is just the beginning of our sport rivalry, this time in KoW. Second, please, remember it was just 4th game for me and 1st for Darth so I am sure we made plenty of mistakes, in particular in the movement phase. 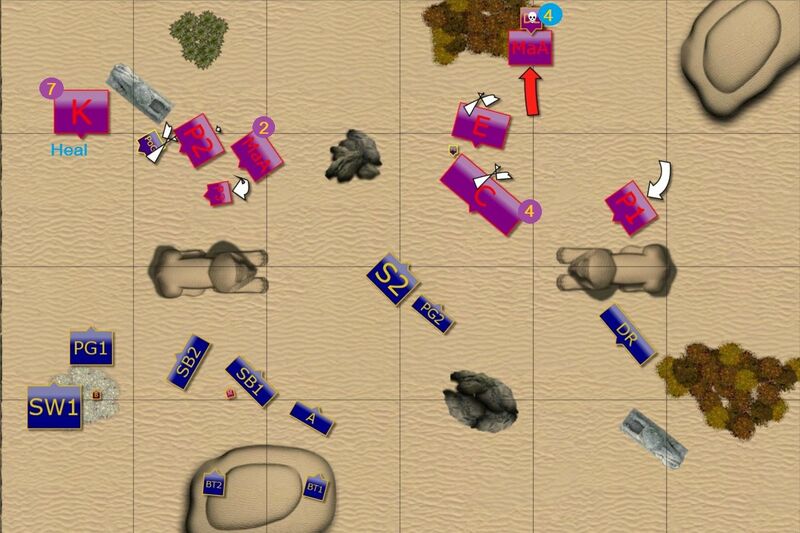 I am still not quite happy how I played on the left flank as I think it took me 1 turn too long to win there. I also made that silly mistake with Silver Breeze cavalry where I didn't make sure they are out of sight and/or range of the horde of spearmen. Not only I lost the unit for nothing but made the enemy come closer to my other units. At the same time I am very happy I spotted the opportunity to use Drakons to great effect where they shut down enemy shooters and were in a great position to finish them off too. I am glad that the plan of getting rid of smaller units with shooting worked but I am also sure Darth will come back with vengeance next time we meet. Thanks for reading and we are looking forward to your comments and feedback! Last edited by Swordmaster of Hoeth on Fri Dec 18, 2015 3:52 pm, edited 3 times in total. Congrats on the victory. I felt Darths inexperience showed here, you maneuvered nicely and set yourself up for mass charges on turn 4. His forces were spread too thinly and were easily overwhelmed. He should have left a few juicy targets as bait to draw your changes, so he could have counter charged. But i think it takes a few games of experience to really get a feel for Kings tactics, it's quite different to Warhammer Fantasy. Check out the 'kings of War MSU strategy' video that went up this week on YouTube, really interesting and I definitely think it can be an effective strategy in this game. I think my first mistake was letting you go first - If I had went first I could have controlled your left flank better. 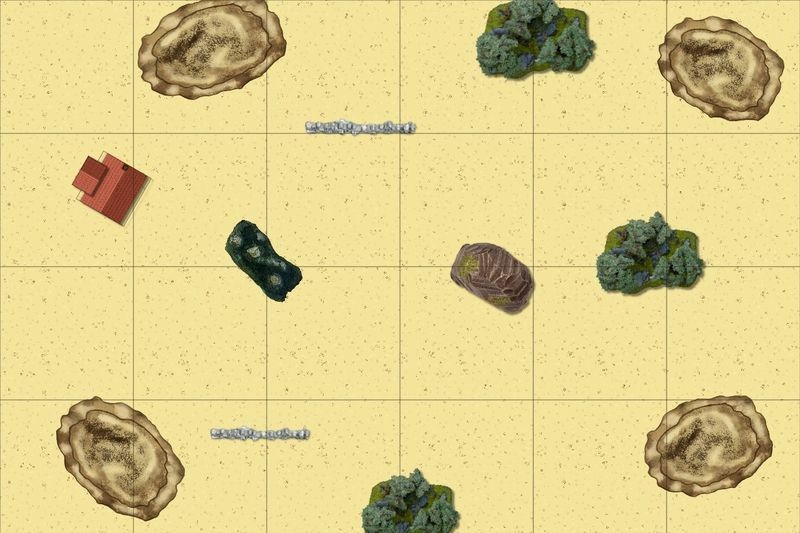 Secondly I should not have given you the gap for the Drakon Riders - your shooting was going surprisingly well so I thought I needed to advance when in reality I could have advanced as a line and prevented the flank & rear charges. 1. Movement is key - need to get out of the old WHFB mindset - not being able to wheel multiple times will take some getting used to. 2. Fixed charge distances are hard to deal with when you are against a superior movement army. 3. Shooting with 5+ to hit is abysmal - elf shooting at 4+, especially with the BT's was a killer. 4. Individual characters are hard to deal with when you cant get to them - not sure how to deal with that atm. 5. I think a KoW army needs multiple threats to make your opponent think really hard about deployment - we played the basic kill scenario - with the other scenario's deployment and movement will have greater influence. I am sure he will get his revenge next time we play as I am still learning the game myself. I watched that video about MSU and also tried to contribute to the discussion on that matter at Mantic forum. I believe the concept needs to be re-defined and probably be considered in the frame of the army rather than general. Simply because some armies will always have lots of units. Our own Lord Anathir was playing with The League of Rhordia and had 18 deployment drops. However, I am very eager to keep testing my 15-elements army and I will just see what kind of things I would really need in it with time. After 4 games I can say that the last 2 were much more enjoyable from the point of view of my own army. What I mean is that in first 2 games I really was not sure what I can do with my force and played badly. Now, I seem to understand better the role of each element and how they should interact with each other. I hope I will get some games against different enemies on regular basis and I plan to start playing scenarios eventually too. Yeah the world is crying out for good Kings of War strategy guides. Slim pickings at present, even more so for MSU. I'm going to run a 2500 point 20 element Elf army myself for the next few games, I'll let you know how it goes and maybe write a tactics article somewhere down the line. Lots of solo mounted or flying characters. Chaff and out maneuver them to death. The strengths of the elf army (reliable power on the charge, lots of small units with high morale, universally high mobility) make them great at this strategy, the ideal MSU faction in my opinion. Darth did really well to identify his mistakes, he will be a very good player very soon. Things are different, but years of Warhammer experience definitely helps. A lot of strategy carries over once you are familiar with the system. Indeed, it is not that easy to find a good article at the moment. But I hope people will start producing them eventually. At least there are more and more reports (check youtube) and blogs and podcasts. I would be very curious about your findings and 2500 sounds like a huge game in KoW. That is another interesting observation about KoW, as with 2000 you already stretch the army from one side to another. Hence, the chance to maneuver is smaller and no wonder people are so fond of fliers. I am sure Darth will be coming back with vengeance and i can't wait to see how the biggest event in Australia, CanCon, will shape up for KoW players early next year. The enthusiasm is there and people are busy now with finding their way in new system. Hopefully I will be able to arrange a re-match against Darth as I know he intends to go for that tournament and will need plenty of practice! Darth also told me it was very refreshing to play that game as he knew exactly where mistakes were made. Something, he says, was not that obvious with Warhammer. And he definitely, even in his first game, was not feeling like he already lost. From my part it was not that easy at all. In fact, I think I got only 400VP or so difference from him so that is not huge. Hey - I'm not logging in much these days, pretty much just checking out the forum for batreps. I've not got much to say on them either these days because I'm not familiar with the rulesets, but they're fun and well laid out to read and are showing me the basics of each system. I've just been to a new club today for the first time since before Christmas - got a game lined up for next week (2000 8th), but apparently KoW is the dominant system there (but they do quite a few), so I'll maybe start commenting again sometime soon. Agree in this one that he split his forces too much...will await the rematch! I would encourage you to try a few games of KoW in addition to any games you might play. In particular if you are looking for a game unit orientated. Or to explore something similar at first glance but quite different in practice. Ur-Elohi - same as last time, very reliable element that serves multiple purposes. What not to like? That feint move towards the right flank helped me to get into better position. I think it is important to remember that pivot and move gives you quite a lot of freedom of movement. 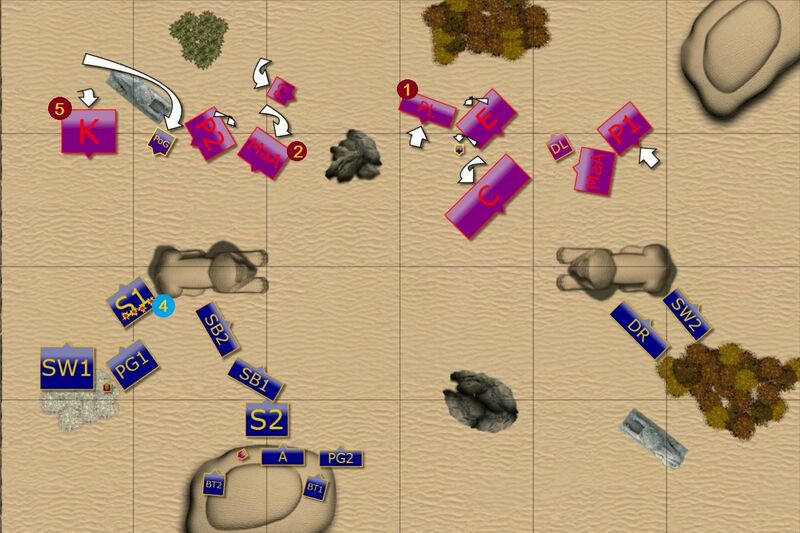 Initially, I didn't think it is enough but now I try to see where my and enemy units can be by looking at their initial position and where they can get by pivoting first. It is in particular very important with nimble units and especially fliers. I am glad it worked but I am sure it will not next time However, I tried that mobility and I am very happy with it. 1. Speed and advantage of charging first. The game I spoke about earlier turned out to be an epic. I finished with 1140 points of my elves left on the table, he had 1135 of undead. Unfortunately I got so into the game that I forgot to take pictures after turn 3, and I can't really remember what happened well enough for a full report in summary I made a big mistake by deploying my two Dragons on the left flank, my shooting and infantry central with my standard bearer and mage with Talisman of Inspiration behind them, and my Drakons and other cavalry on the right flank. That's right...two sources of Inspriring on the left, two centre, and ZERO on the right. The right flank needed one of the dragons, but instead it collapsed and his werewolves swept into the centre. However the double dragon left flank was won easily by me which led to roughly even levels of bloodshed in the middle. My 'aggressive defence' strategy worked reasonably well despite obvious deployment mistakes, but my shooting was totally ineffective. The undead easily managed to restore and heal the little damage I was doing. 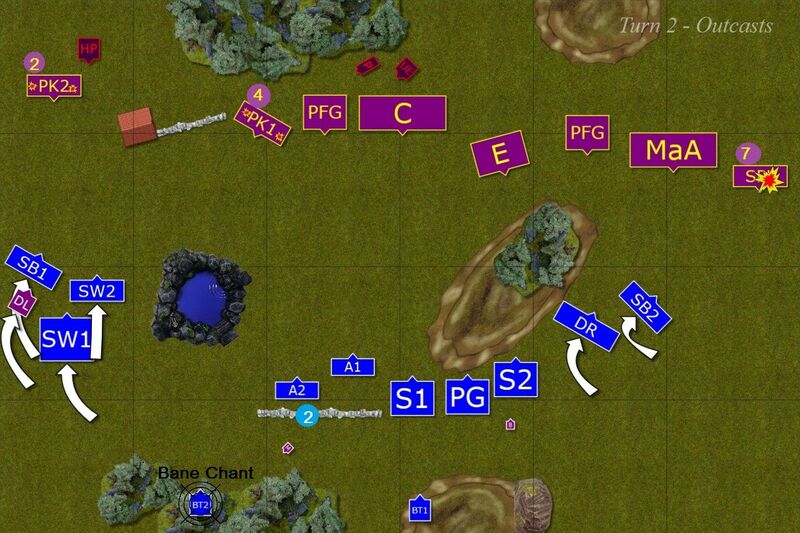 Then when it came to combat in turn 3 onwards, my archers and Silverbreeze were useless, disrupted and unable to shoot and useless on the charge because of 5+ melee. Your comments on shooting are interesting. I have played about ten games of Kings now and observed at least that many other games, as well as reading and watching many battle reports. 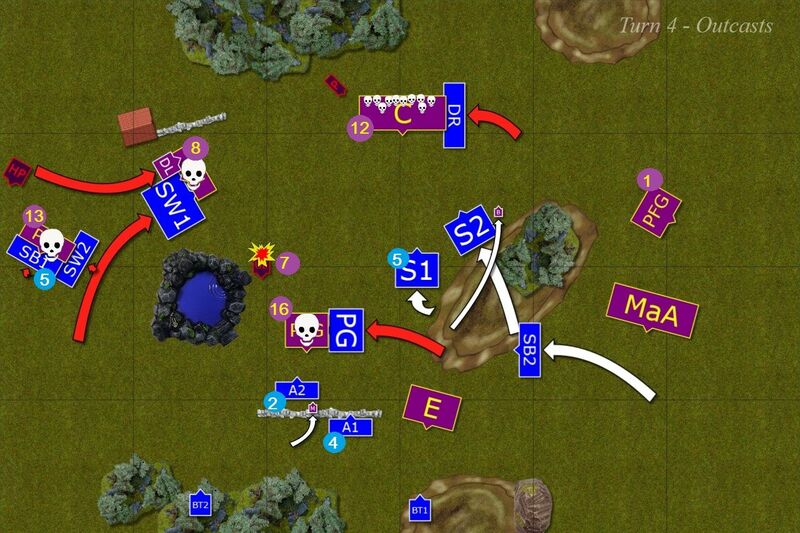 Increased experience continues to reinforce my belief that Kings of War shooting is simply too weak. Cheaper units of Palace Guard just seem to be able to do a lot more for their points. I've decided in the next game to drop all my shooting entirely and play a much more aggressive style. It is interesting to know that you consider shooting too weak. I guess my army does not have much in that department in comparison to 4 bolt throwers for example. I seem to recall that shooting was much better in v.1 and that is why it was downgraded (reason why many war engines hit on 5+). But there are some people who still seem to see it as too powerful. It might be just my point of view on the shooting I have in the army though. it does not exclude the possibility that other armies that focus on that part of the game are actually quite powerful. This time I disagree. I take shooter troops precisely because they can inflict enough damage on enemy small units and force nerve tests that have a chance to waver or ever rout the units. The reason I take few of my own is that I can inflict more nerve tests on enemy troops. I learned myself it can hurt when I left silver breeze out of inspire range and lost them when they received only 2 points of damage. 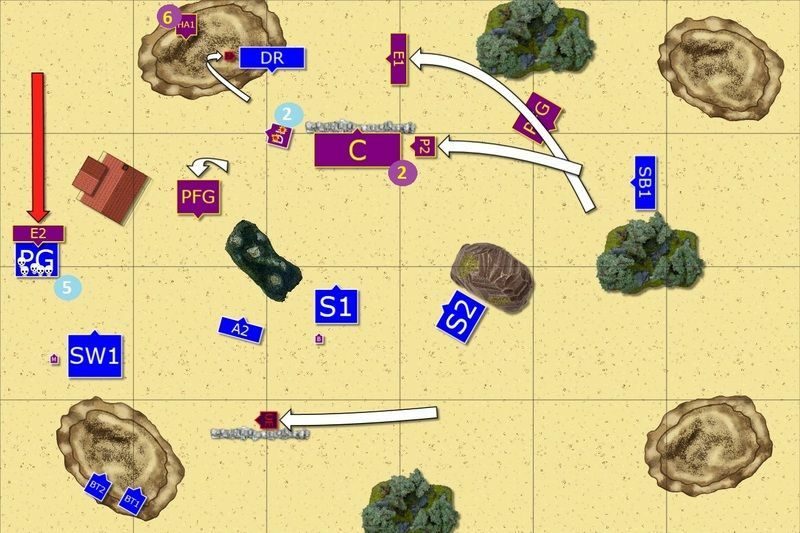 Another quality battle report you've posted SM, thanks again. With the Empire of Dust army I've been playing with on paper my shooting doesn't really get any more than a pair of balefire catapults and even then paying 200 points for those that only hit on a 5+ (which ironically enough I think is the same odds in Warhammer with scatter dice?) has me scratching my head. Still though I don't have any real tangible experience yet so it's all here say. Thanks for the game report, hopefully in a few weeks I'll have something more solid to add to the mix. Great to hear from you and thanks for stepping by! It is quite interesting to see what your impressions are because in general Elven shooting is considered by some as over powered. Even Bolt throwers hit on 4+ and then you have Elite rule that allows re-rolls of 1's. In my first two games I didn't hit that much but my last game (report on my personal blog at the moment) I destroyed 2 heavy cavalry units with shooting alone. It required focusing fire on a single target with 4-5 units for 2 turns but it actually paid off. No wonder some players take horde of archers with item that adds to range, keep mage nearby for Bane Chant and add 4 Bolt Throwers for good measure. I do understand it may look underwhelming for other war engines that in general hit on 5+ and may have single attack too. The thing is that having them in the army can still be useful. They don't blow up When they hit, they hit hard. And because of that cannot be ignored. The catapults have the rule Indirect that allows them to be positioned in even safer and not exposed spots so getting to them requires effort. Not to mention the target don't get cover! They are good psychological weapon. And if you have a few more elements, such as other shooters or spells, then you can focus fire as I did last game and still take out even well armored units. 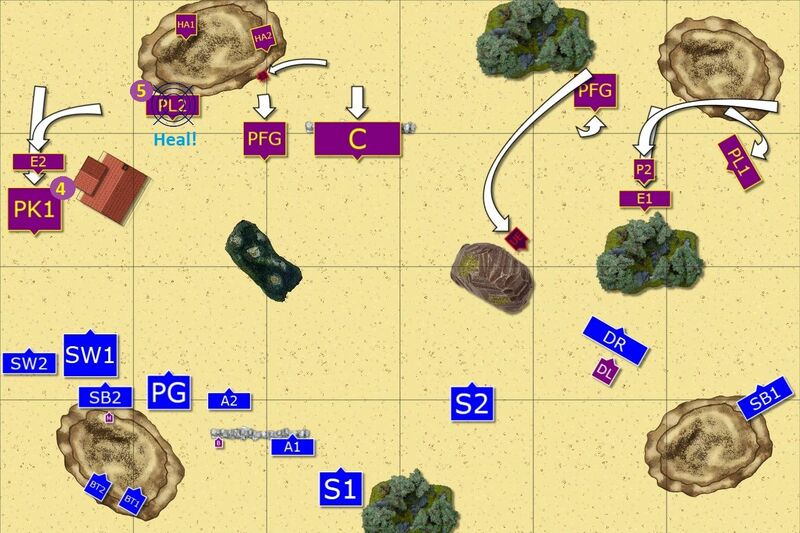 That, however, needs good coordination because your other units will be moving in between and to pick a clear line of sight towards the enemy might not be always possible or easy. In general, I think you raised a very important point because the shooting can be viewed as weak support. However, it is required and one of the element of anti-fliers tactics (another power house in KoW) is to have some, preferably as breath attacks. The main difference in comparison to previous games was that Men-at-Arms with Spears showed up, no doubt to counter my heavy cavalry with Phalanx. Elohi grouped together into a single unit and got blessed by the gods so that they could use Elite against Elves themselves and let them taste their own medicine. This army can form very nice battle line with infantry deployed either wide to cover a lot of area and keep the flanks of the crossbowmen protected. 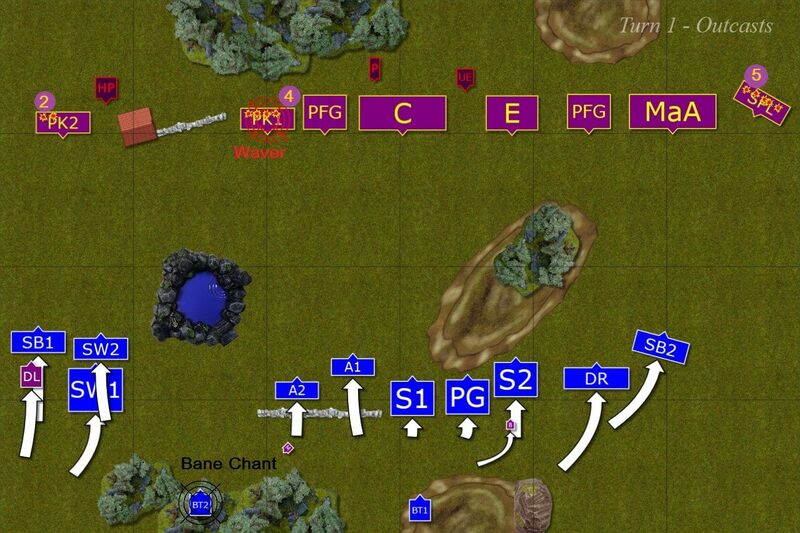 Or in double line if needed, to receive the charge and have units ready to counter. Elohi and the Knights are obviously the hammers of the army that can be further assisted by Griffon and Panther Lancers. 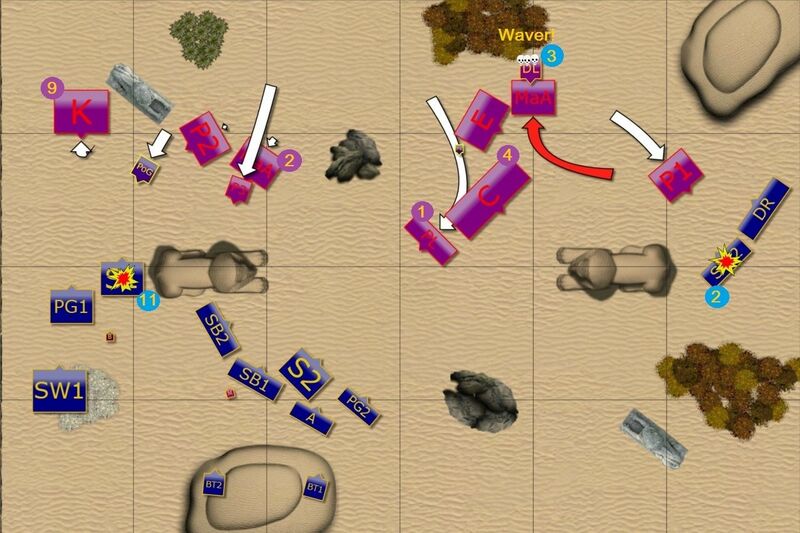 These fast units can be very dangerous if adding to the effort of the main heavy hitters while attacking from the flank. Darth had some good shooting options in the form of breath attacks in his fliers too and crossbowmen with +1 to hit are always a threat. In particular to my small units. As always, healing abilities of the army thanks to the army wide special rule (Iron Resolve) and characters spells were a great asset. The general idea was to avoid war of attrition as I think that benefits the opponent. He has better healing and with many units being Headstrong, he can continue fighting better than my units. Also, being close means I give him more opportunities to use breath attacks to finish off damaged units too. I expected some maneuvers at the beginning because my faster elements want to get to the targets they can harm while avoiding Spears and counter from Knights and Elohi. Here is my own army for reference, as I haven't changed it since the last game. As you can see there is plenty of terrain with height 4. I have just noticed I also made a mistake, as the hill on the South was height 2 only, my apologies for that. Then we rolled for scenario and got Dominate! It was the second time I played this one and I find it very intriguing as it forces you to hunt down expensive units of the enemy while trying to keep your own safe. Final deployment with the scenario area marked. I didn't have staying power to just go to the middle of the field and defend it from the enemy so I had to choose different tactics. I won the roll off to pick the sides and I chose South. It was obvious I would use the hill for my war machines but it was just too good to pass even if Darth knew already where my bolt throwers would go. 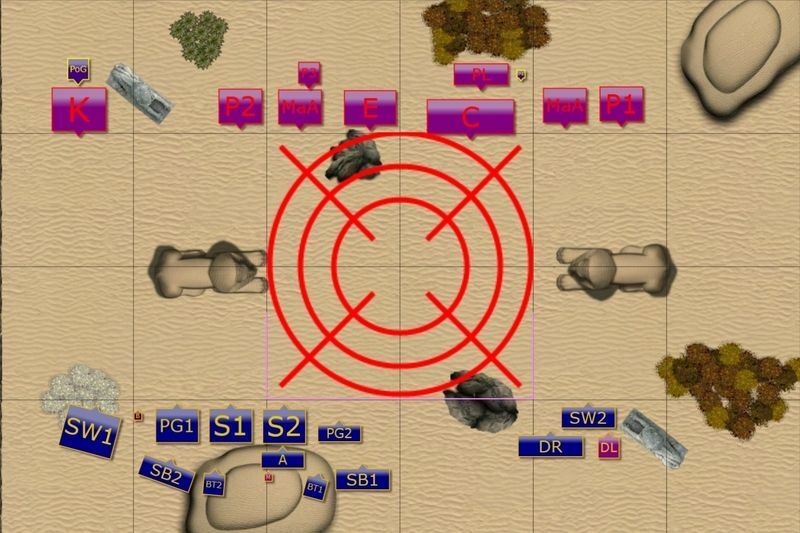 It just gave me a very good opportunity to shoot at the center of the battle field so that I could try and rout some units from the area that counted for scenario purposes. At the same time I wanted to make sure no units are in range for crossbows and if possible, keep it that way as long as I can. They are one of the most expensive units in the enemy forces too so I wanted to use my own speed to try and isolate them and then hopefully destroy them. 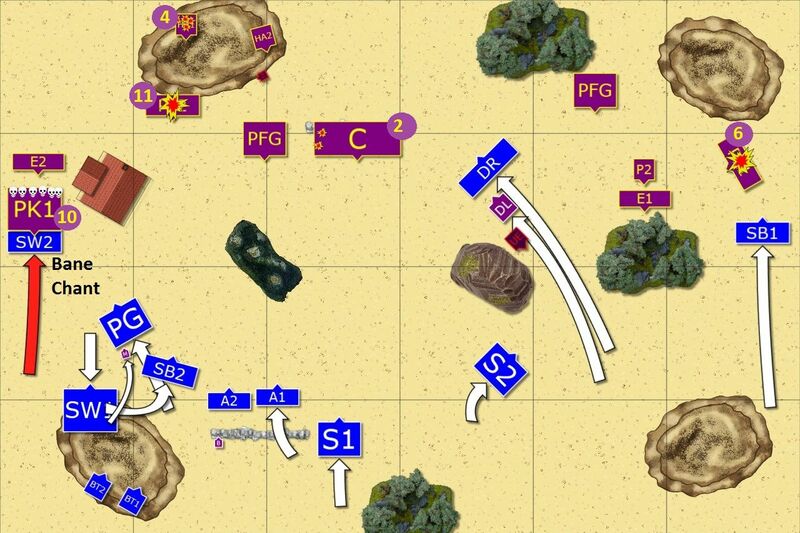 I expected that unit to move towards the center and keep shooting at whatever it could. By doing so they played a very important role for the scenario so they had to be dealt with. Elohi and Knights were also elements that were very expensive and mere presence of these in the middle of the battle field would be a huge swing in Darth's favor. Hence, my idea was to try and attack from the flanks to try and lure them out long enough to be too late to come back and land in the middle again. And if possible, destroy them too. I definitely wanted a second turn because I thought that with the natural speed of the Elves I could jump in with them on the last turn and try to secure the victory if simple routing of the enemy regiments would not work efficiently enough. Especially, considering some expensive fliers that can hide whole game and still make a difference in the end. I got lucky and won the roll off and handed the first turn over to Darth. Forces of Basilea moved forward cautiously. 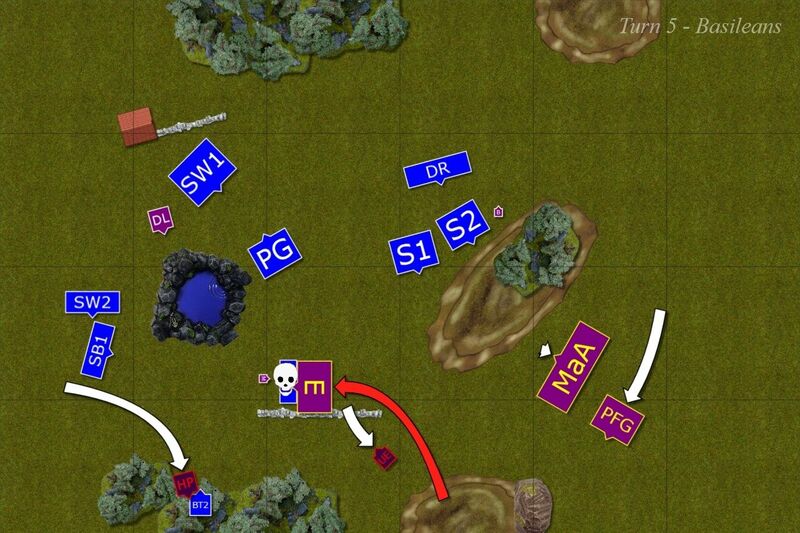 Their own shooting was not yet in range but some units didn't want to get into that of enemy either. Elves reinforce the flanks and open fire. Elves moved on the flanks, stronger West kept the enemy Knights in check while one of the Bolt Throwers hit them a few times. In the middle, the shooters decided to focus fire on Men-at-Arms in case they wanted to reinforce the Knights. The units on the East used the nearby statue as a cover while Drakes pulled back a little. Basileans continued to approach with caution, clearly not wanting to get into range of Elven heavy cavalry. Their amazing healing abilities allowed for some proper recovery of damaged units. Unfortunately Crossbowmen still could not find any targets and had to move forward a little. Elven infantry moved boldly forward on the West. Tallspears were tempting human knights to charge them but the trap was too obvious. 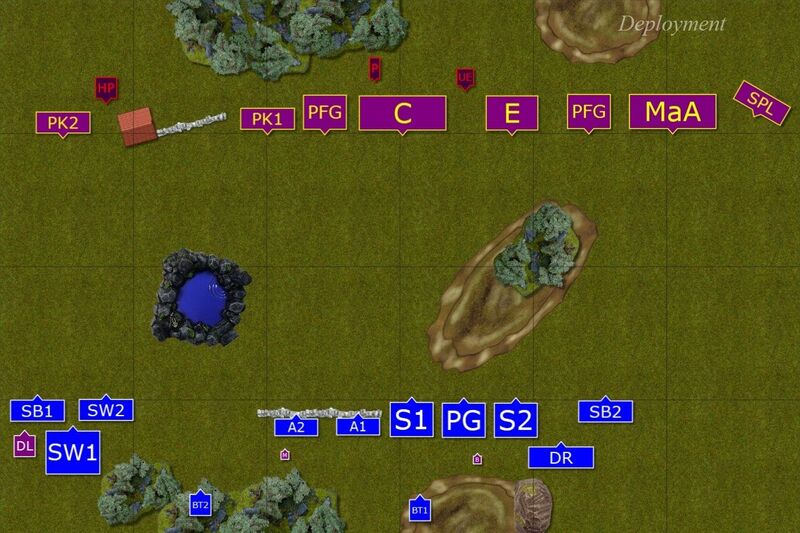 Bolt Thrower crew kept shooting at them while the rest of ranged attacks were directed Panther Lancers. But for now no significant result was achieved. Drakon Lord managed to find a safe spot to land behind enemy lines and cause some trouble. More healing with a little bit of shooting. 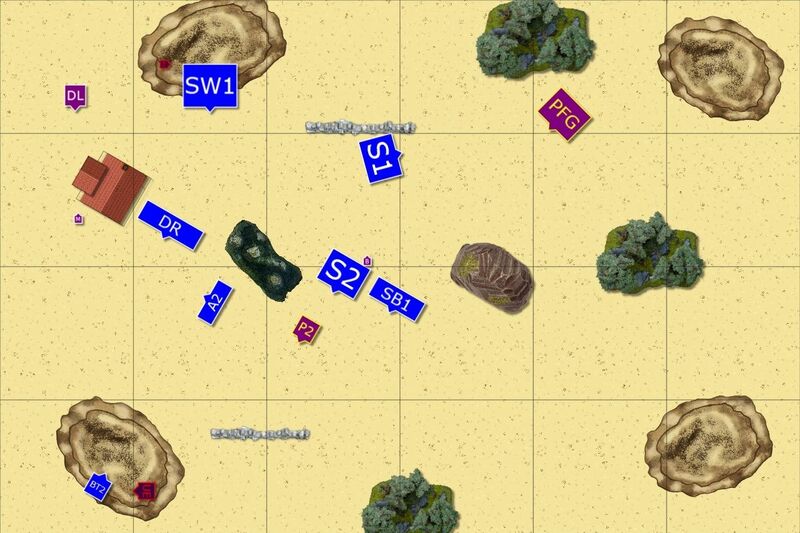 The battle line of Basilean army breaks cohesion a little. On the West the units try to converge on the flank better to support the Knights. Paladin on Griffon attacks nearby Tallspears instead of healing his own units this time. On the East, the units try to cover their backs in case Drakon Lord starts to be more aggressive. And Crossbowmen turn towards the flank anticipating some enemy might finally emerge from behind the cover of a statue. Elves decided it is time to be more decisive. On the West infantry moved forward to intercept the Knights but in doing so kind of blocked cavalry. Mage tried to heal Tallspears but was not quite successful. In the middle second unit of Tallspears and Palace Guard used the opportunity and moved towards the Crossbowmen while they were not looking. Shooters also aimed at them but didn't inflict that much of a damage. On the East fast units were a little bit too reckless. First, Drakon Lord was arrogant enough to land in front of Men-at-Arms and taunting them to attack him. Then Storm Wind and Drakons indeed left the safety of the statue but landed in a place that gave clear line of sight to any of them for enemy Crossbowmen. They were about to pay for such folly. Forces of Basilea claim first kills. Basileans finally launched some attacks. 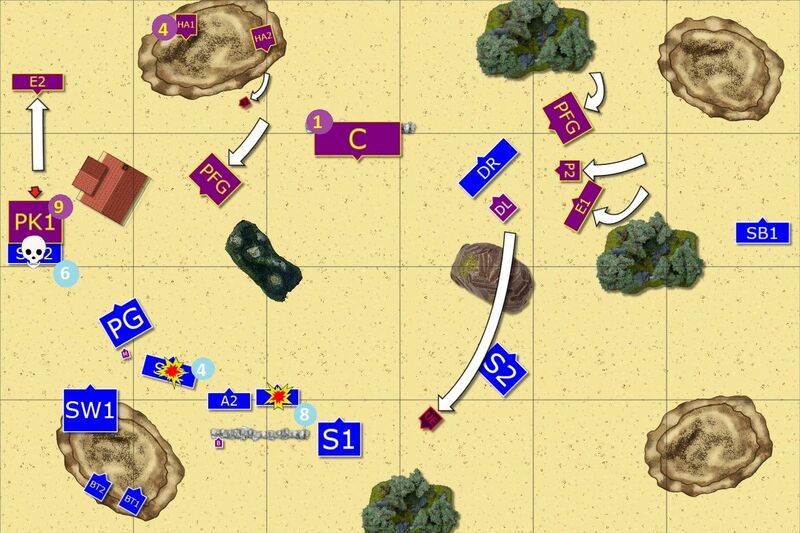 Griffin and Phoenix routed Tallspears and suddenly it was Basileans who had advantage on the flank. On the East Storm Wind cavalry was also routed by a few well chosen crossbow bolts. While Men-at-Arms wounded and wavered Drakon Lord! That was definitely a good moment for Forces of Basilea! It was a tough blow to lose two units but it was far from over. 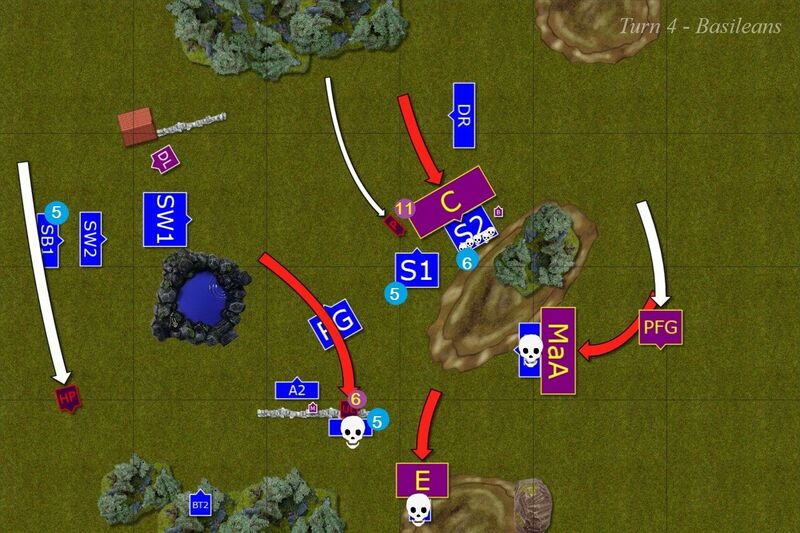 On the West, heavy cavalry didn't took the bait and pulled back. So did Palace Guard. The odds were not good for Elves so they kept shooting at the Knights, this time with the aid of Silver Breeze cavalry too. The damage was substantial but the Knights only wavered. In the middle of the battle field it was a bit better as Panther Lancers were routed by shooting , thus opening the path towards exposed Crossbowmen. Drakon Lord could only pull back into the forest and hope for some extra protection it offered. Drakon Riders also decided it is better to come back to the safety of the cover. Basileans reformed after the previous successes, eager to capitalize on them. The Knights, now with a bit of released pressure, got some healing done. Crossbowmen faced incoming enemy infantry with Elohi waiting nearby to counter attack. Behind them, Men-at-Arms eagerly entered to woods to hunt some monsters but this time Drakon Lord was not harmed much and was free to fly away. Elves launched their own attacks at this moment. The forces on the West decided it is about time to turn and race towards the center to occupy it before the enemy. 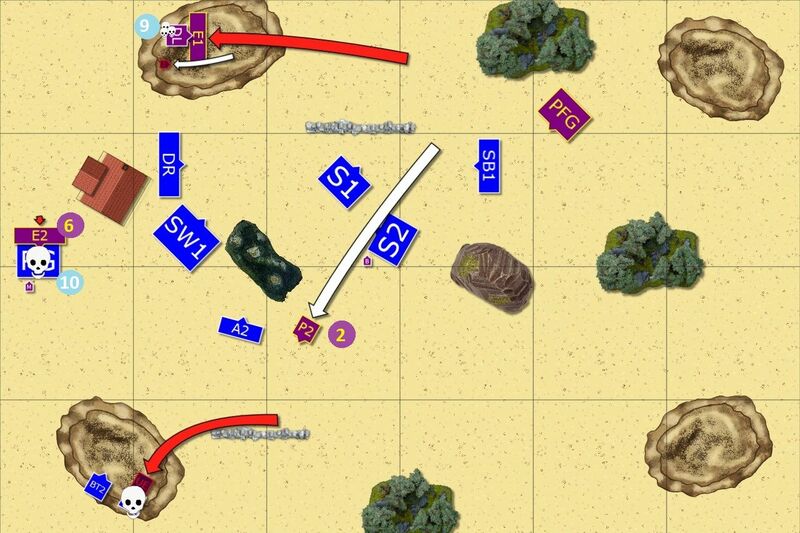 Both fast cavalry sped forward to cover the maneuver and to block enemy units from entering the zone. Bolt thrower crew finally managed to inflict enough damage to rout the Knights. The situation for Basileans turned from good to bad in a matter of seconds. They lost their two most powerful units, their infantry was either blocked or too far from the center of the battle field and the Elves were in good position to add some more regiments there anyway. 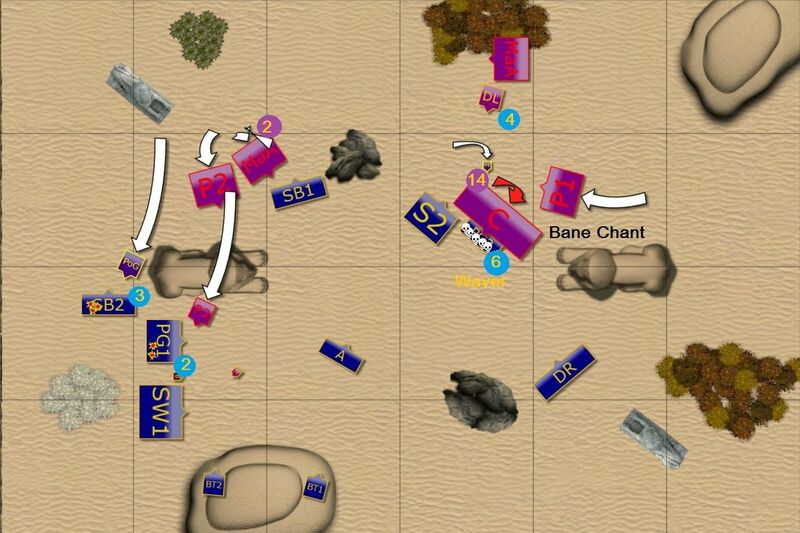 Basileans launched their fliers then to try and rout some more Elven units but they spread their efforts and no significant effect was achieved. 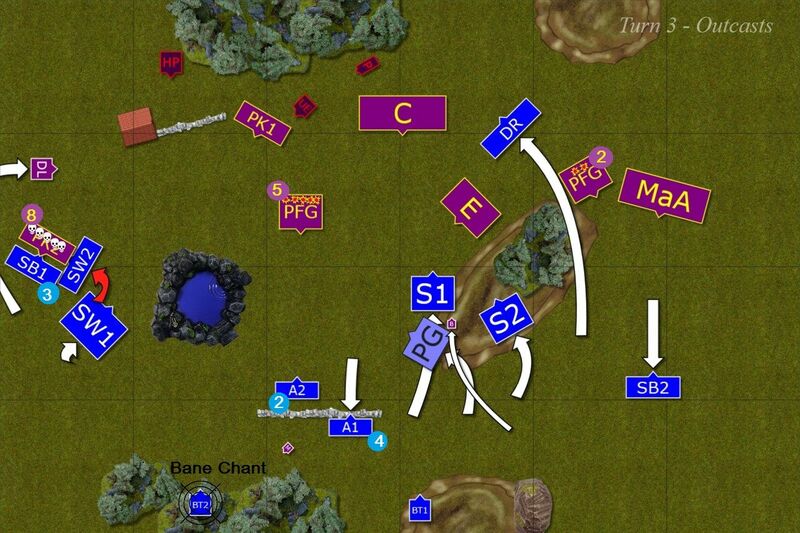 Situation at the beginning of Elven turn 6. At this stage Darth decided he has not chance to break through towards the center and to balance the number of units I could have in the zone to change the result of the battle so we stopped at this stage. I had a chance to flank charge Paladins with Drakons to hopefully prevent them from entering the middle of the battle field in the case of turn 7. I also was looking at a charge against the Priest with Drakon Lord or against damaged Crossbowmen or even against Paladins to assists the Drakon Riders. I think I would attack Crossbowmen with Tallspears just to make sure I clear the middle ground from enemy troops. Then both my characters and Stormwind cavalry were free to go there too, making sure to be in position to counter any infantry assaulting from North-West. I would have to attack the Phoenix with my Palace Guard. Not sure if that would have been enough to rout it but I was losing nothing in trying. I must say I didn't expect that dramatic shift in the 5th turn. I charged Elohi simply to distract them, do some damage and prepare for their charge against Drakon Lord (good because that leads them away from the middle zone for scenario objectives). Or if they didn't attack him I would be in position to charge again, maybe even with the help of Drakon Riders. I am of course very happy with the victory but I made some mistakes that were unacceptable. First, it looked like a minor one because the enemy didn't move against Palace Guard on the West. However, if they got charged by the Knights and Griffon they would probably die. That would allow to break through. Or even worse, if they wavered, they would block my own heavy cavalry. Even worse mistakes were made on the East where I exposed units for shooting. That was totally unnecessary and I could have avoided that by simply checking the distances. Same with the Drakon Lord where I got lucky not to be routed by Men-at-Arms. It was interesting to observe that the game was not dynamic most of the time simply because neither of us wanted to commit on the flank. I think it worked for me better because I could still shoot at the Knights with my Bolt Thrower and then had enough time to turn and race towards the center of the battle field to fulfill the scenario conditions. 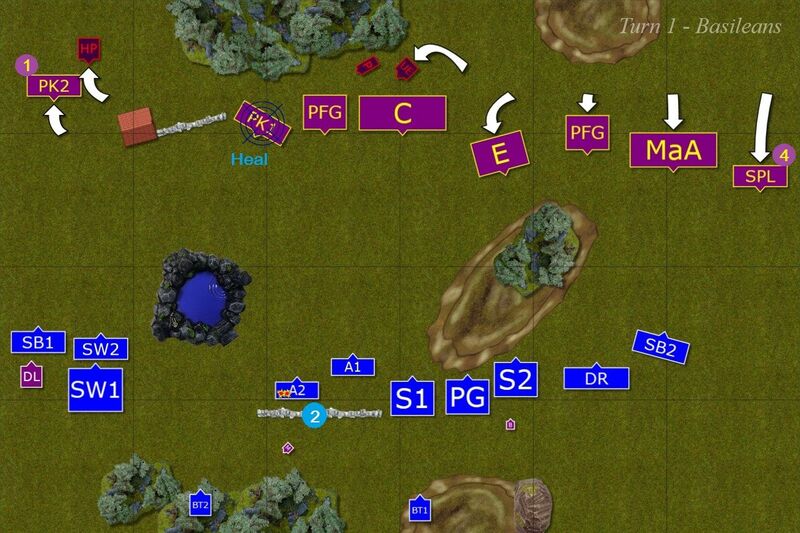 I am not happy with the deployment though because I didn't use the Archers at all. They had some shooting opportunities but did nothing anyway. They were too far from the start. I divided the shooting too much. I am happy with the way Bolt Thrower and fast cavalry did on the flank but I could use my other shooters to hit Crossbowmen earlier. I am definitely not complaining about the results in general, I just think I could do it better and achieve more. I also think that the fact that Darth was quite shy with advancing his units and then moving them away from the center of the battle field, helped me to block his regiments and secure the victory. We discussed the options after the game and Mr. szypul, who observed the game, gave some good ideas on how to deploy Basileans better. He suggested to use the fast elements on the East and attack aggressively from there. 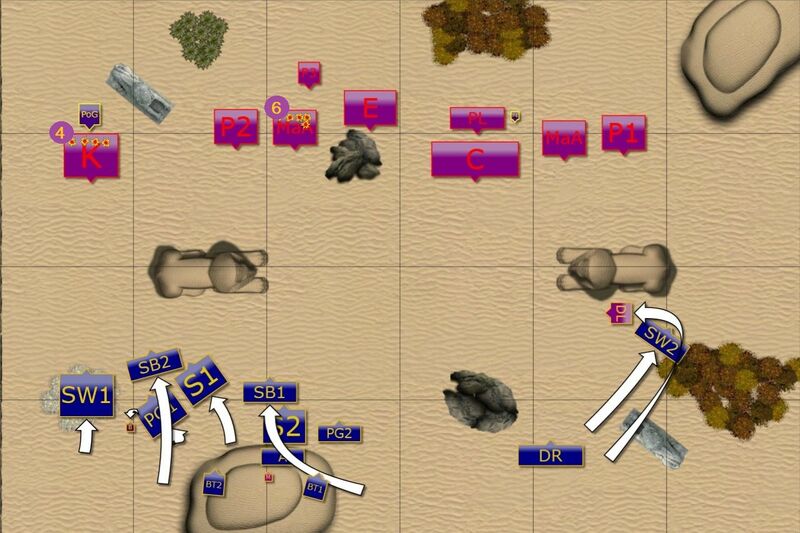 Then use the infantry in the center to maintain cohesion and provide axis for the whole outflanking maneuver. Darth also mentioned that he is still looking for that army list that would suit him the best. He tried a few iterations so far but he is not satisfied yet. He is thinking about adding shooting contingent of Elves instead of his own Crossbowmen, for example. I hope he will find the balance in the Force because it would be a shame not to show off these beautiful models he is currently working on! Darth, it was a great pleasure to play against you, as always and I am sure that despite the losses you are not going to give up and will get me next time! I really got lucky! Bump on active topics - I've got a game in hand to read here!